French artist Oskunk strikes again, this time with a Metroid-themed GameBoy that features a stylized Mother Brain on its front and a swarm of the titular creatures on its back. 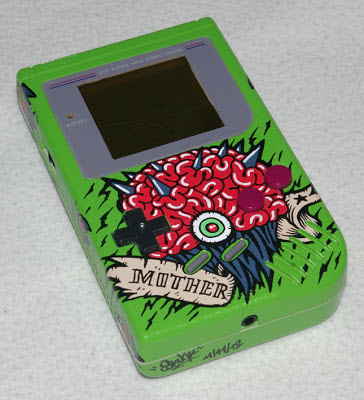 If I had any say in the matter (and I don't), Oskunk would follow up this creation with a custom-painted GameBoy Advance SP that features some sort of Mother 3 imagery. To see a few more photos of this playable piece of art (including two of its beautiful backside), though, head on over to Oskunk's blog pronto. Not a fan of the Mother 3 GBA Micro? Oh, I like it well enough, Jyr, although I don't like the prices it goes for on eBay! Also, the design is perhaps a bit too subtle for me. That's why I'd like to see what ol' Oskunk could come up with. Me, too, Melody! I don't know if he/she even sells them, to tell you the truth. I've certainly never seen them for sale anywhere. Anyway, you're probably right that they're sure to be expensive if he/she *does* sell them. Ha! I like your straightforward reply, Tom :) Also, I can't help but agree with it. Man, it must be nice to be as talented as ol' Oskunk, don't you think? Definitely. Hmm, I wonder if there is a template for Gameboy cover designs somewhere on the net? Photoshop skills, engage. Fingers crossed that you find some awesome designs, Tom! Stomp on my heart a little harder, why don't you?